Mike Koentop, the executive officer of the Department of Energy’s Oak Ridge Office of Environmental Management, said the agency had resolved a formal dispute with the U.S. Environmental Protection Agency and the Tennessee Department of Environment and Conservation regarding a new mercury-treatment facility at the Y-12 nuclear weapons plant. “The dispute related to the proposed Outfall 200 Mercury Treatment Facility has been resolved,” Koentop said in a statement responding to questions. “Resolution of this dispute with EPA and TDEC settles matters related to the size and performance expectations for the facility, and allows us to proceed with design activities for the facility,” the DOE spokesman said. The new treatment facility is one of several projects planned to reduce the migration and discharge of mercury deposits from Y-12, which used the toxic metal in vast quantities during the 1950s and ’60s for lithium separation work associated with development of H-bombs. The East Fork Poplar Creek, which receives the brunt of the mercury discharges, has been posted as a hazard since the early 1980s. Some details of the new treatment facility and its capabilities have yet to be reported. 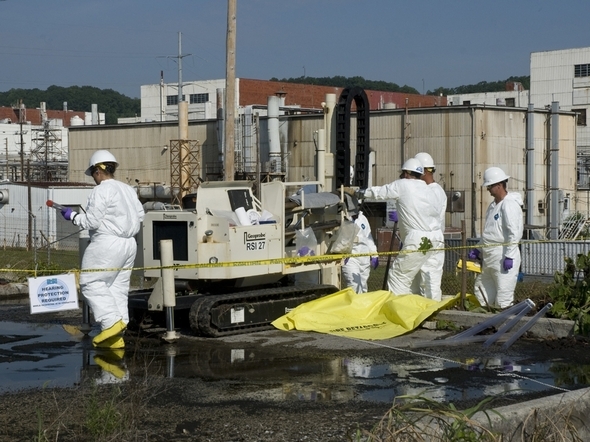 This entry was posted in Cleanup, mercury, NNSA, nuclear, Oak Ridge EM, Y-12 on May 31, 2015 by Frank Munger.